There are so many words to describe what is or what might be happening in this photo from the 2018 Santa Express! Submit your caption (or captions - you can enter up to 5x per email address) below to enter. The top 11 most creative/clever/thoughtful entries will be selected for prizes. The Grand Prize is a January Anywhere TrailPass. The runner-ups will receive a SEPTA t-shirt. Contest ends Wednesday, 12/19. 2. Promotion period runs until 11:59 PM ET, 12/19/18. 3. 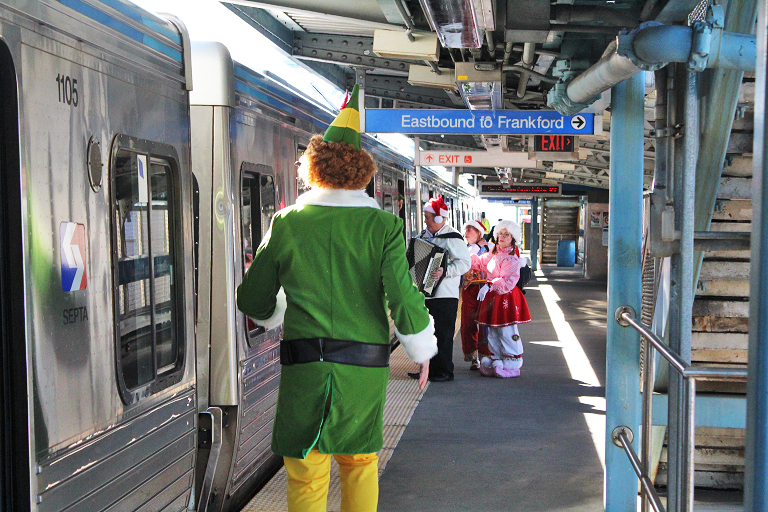 To enter, an entrant must enter at http://iseptaphilly.com/contests. Five entries permitted per email address. 10. Winning entries will be selected by SEPTA's Marketing Department. The top eleven (11) qualified, most creative/clever responses will be be selected for prizes. Grand prize is a January Anywhere TrailPass. All determinations by SEPTA are final.